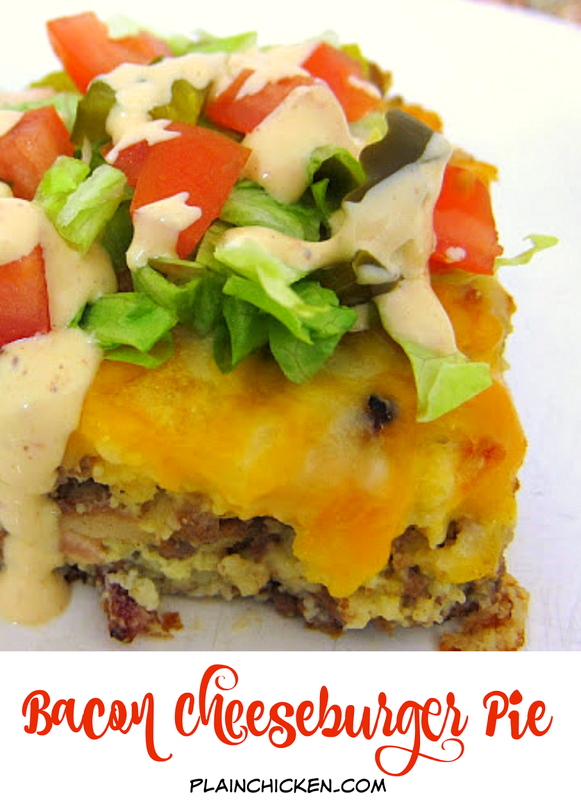 Bacon Cheeseburger Pie - Impossible Bacon Cheeseburger Pie Bisquick - beef, bacon, cheese and a quick Bisquick batter. Top with favorite burger toppings. Quick and easy weeknight meal! We recently made the Impossible Taco Pie for dinner. It is one of our favorite week night meals. As we were eating it, I thought about switching up the flavors and making a Bacon Cheeseburger version. After a few tweaks, I came up with this recipe. It was a big hit at our house. This has all the flavors of a bacon cheeseburger, but in the form of a pie. We topped the pie with lettuce, tomatoes, pickles and some spicy ranch dressing. Chicken Legs LOVED this. He could have eaten the whole thing by himself. Thankfully he shared with me! We even had a little leftover for him to have for lunch the next day. I call this meal a success! In a large skillet, cook ground beef until no longer pink. Drain fat. In the same skillet, cook bacon until crispy. Remove from skillet and chop. Lightly spray a 9-inch pie plate with cooking spray. Combine hamburger, bacon, ketchup and mustard. Put into pie plate and top with cheese. Whisk together Bisquick, eggs, milk, salt and pepper. Pour over meat/cheese mixture. Bake for 30 minutes. Top with favorite hamburger toppings. I am so making this !!!! This looks like a perfect weekday dinner. Thank you! Very interesting. I have not made a Bisquick Impossible pie in years....might have too. Made me think inside out cheeseburger! That sounds like something we all would like. I especially like the topping of veggies, that really completes it. Made this for dinner. Even the picky 2 year old grandson settled down long enough to clean his plate! What is that good looking sauce you drizzled on top?? I don't have bisquick and will not buy it...anything I can make from scratch?